With all this talk about human colonies on Mars, why not dream a little bigger? Dr. Stephen Kane and his team of researchers at San Francisco State University are looking about 14 lightyears away from our solar system for some potentially inhabitable real estate. 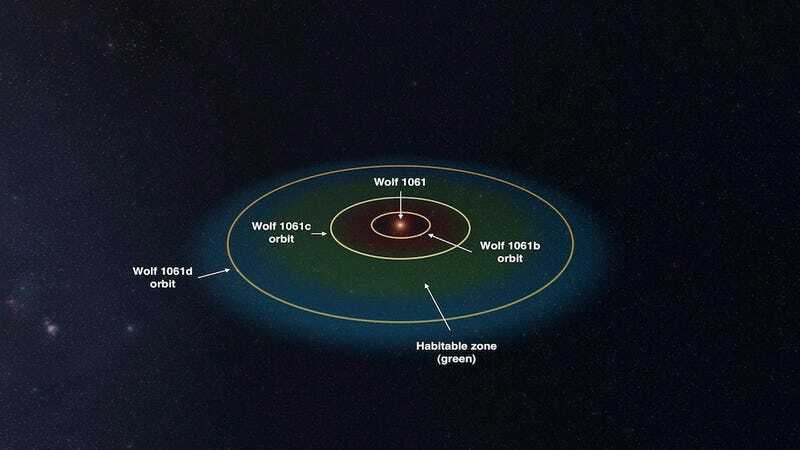 Wolf 1061, a star system not terribly far from our own, has an interesting planet called Wolf 1061c. While scientists have known about the exoplanet since 2015, Kane and his team discovered that it’s squarely within the habitable zone—the region in the solar system where the atmospheric conditions could support liquid water. That said, Kane said that if there’s any life on the planet, it must be living under hostile conditions—similar to those of Venus—since it’s on the inner edge of the habitable zone, relatively close to its star. “The Wolf 1061 system is important because it is so close and that gives other opportunities to do follow-up studies to see if it does indeed have life,” Kane said, according to Sci News. His team’s findings will published in the next issue of Astrophysical Journal, though a pre-print is available here. The analysis of Wolf 1061c’s atmosphere could serve as an important case study for scientists looking to determine which exoplanets can support life. 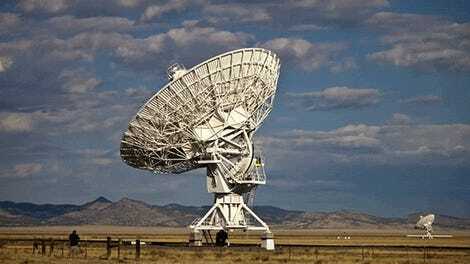 But while folks like Kane are analyzing whether or not exoplanets are possibly habitable, other groups, like Messaging Extraterrestrial Intelligence (METI) are searching for signs of more advanced extraterrestrial life. Doug Vakoch, president METI, told Gizmodo his team has observed Wolf 1061c from their optical SETI observatory in Panama on four separate occasions. Alas, no luck yet. “I’m not holding my breath that we’ll ever find evidence of life on Wolf 1061c, but the fact that there’s a roughly Earth-like planet in the habitable zone of a star so close to our own solar system is a good omen as we continue our search for life on other planets,” Vakoch said. “We’ll try [to observe Wolf 1061c] again later next month, when it’s visible there again, using a more advanced detector system developed by Ben Schuetz, Director of the Boquete Optical SETI Observatory,” he added. METI will continue its search for life outside the solar system, regardless of what it does or does not find on Wolf 1061c. But this latest bit of research from Kane and his team makes the planet a much more appealing prospect for further study. “If we transmitted a radio signal to this exoplanet today, we might get a reply back from tech-savvy aliens in the Wolf 1061 system as early as 2045—a mere blink of the eye on astronomical timescales,” Vakoch said. Does This Convince You That Aliens Exist?